Epic Games and Microsoft are letting gamers choose whether the third (and final?) Carmine brother will survive Gears of War 3 or perish horribly - to benefit sick kids. Moral choices are everywhere in games these days, and they usually boil down to two options: Do you do something "good" and put money down on your halo, or do you do something "bad" and get a slightly greater reward? 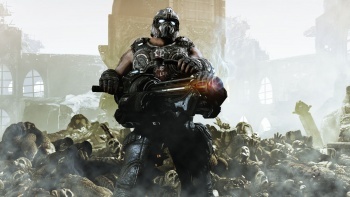 Well, Microsoft and Epic are bringing the two-option moral choice to the real world for Gears of War 3, giving gamers the choice to decide the fate of one of the series' characters - Clayton Carmine. The Carmine brothers are, sadly, the Gears of War universe's equivalent of Star Trek's redshirts - they're rookie soldiers who exist solely to get killed off in a way that establishes the danger of the situation so that we start to worry about the safety of the primary protagonists. But seeing as how killing Clayton like they did his brothers Anthony and Benjamin might be a bit too cruel, Epic and Microsoft are leaving it up to all of us. Starting July 29th, fans will be able to buy one of two T-shirts for their Xbox Live avatars - "Save Carmine" and "Carmine Must Die" - and each sale will cast a vote for Clay Carmine's survival or demise, respectively. But before you start thinking that this is just a quick money-grab, keep this in mind: All of the proceeds from the Carmine T-shirt sales go to the Child's Play charity, which is one heck of a worthy cause. If you'd rather get something tangible for your dough, though, Microsoft and Epic will be selling real-life "Save Carmine" and "Carmine Must Die" T-Shirts for $20 at San Diego Comic-Con this weekend. Gears fans at SDCC can also get their hands on the actual Gears 3, so that's some extra incentive to go if you weren't already. This is actually really interesting to me - letting gamers as a whole choose the fate of a character (albeit a minor one) in a major gaming franchise is something new, and I'm curious to see how it'll turn out. Will gamers be bloodthirsty and vote for Carmine's demise, or will we be merciful and let him live this time for the grand finale? Either way, it's a very intriguing idea, and it's all the better since it's for a good cause. Personally, I'm going to be casting my vote for "Save Carmine," myself. That family's already been through a lot - why kill the third brother, too? Maybe that makes me a softie, but think of their poor mom. Though, on the other hand, if there are four brothers and three of them die, this opens up the door for some excellent Saving Private Carmine DLC. What sayeth thou, internet? Should Carmine live or die?